Ross Clarke-Jones is big wave surfing royalty. He’s been in the mix with 80-90 foot waves on the biggest day ever surfed, he’s ridden a tidal surge up the piranha-infested Amazon River, and is the sole Australian invitee to the Quiksilver In Memory Of Eddie Aikau Competition held in Waimea Bay, Hawaii (and, in 2001, the first ever non-Hawaiian to win it). The 2015/16 season for the Eddie’s was the 28th time he had been invited to compete, and in February this year he came second in the Eddie’s behind Hawaiian young gun John John Florence despite having a rib injury in the month leading in. Last year was a finalist in the 2015 WSL XXL Big Wave awards. Before flicking the switch to big waves, Ross spent 12 years on the ASP World Tour. He scooped 10 fin chops, one broken nose, a fractured spine, separated and fractured ribs, a snapped bicep, pulled trapezium, busted shoulder and several near-drownings. In 2008, he had a career-extending neck operation. After his rehabilitated, he joked that he “feels like a Bionic Man again.” Ross lives in a constant state of preparedness, ready to burn after the mythical 100 foot wave he forever wants to catch, from whichever country he’s in, at a moment’s notice. 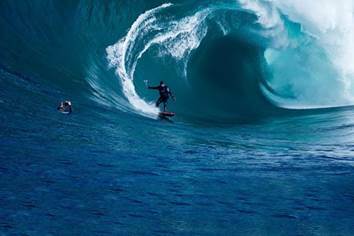 A good example of his fearless attitude was in 2012, when Ross and Tom Carroll went on a quest to hunt down and ride the biggest and most dangerous waves around Australia and the Southern Ocean in a movie documentary called Storm Surfers 3D. During the northern hemisphere winter, Ross divides his time between Northern Cali and Hawaii. “Then during the Australian winter, I live in Torquay and I’ll chase swells across the southern hemisphere to South Africa, Chile, New Zealand, Tasmania or Western Australia,” he says. Ross Clarke-Jones grew up at Terrigal on the Central Coast. Looking down the barrel of his 50th birthday Ross will celebrate with a party in Manly on the Northern Beaches, as well as in Las Vegas. Tom Carroll has said that at 50 he lost his fearlessness and nerve, however Clarke-Jones shows no signs of slowing down and continues the search for the next big wave.